1. Dewdrop Rachel James: born January 7, 1920 in Alabama; married June 9, 1939 in Clovis, Curry County, New Mexico to Jim Wayne Howard; died February 23, 1998 (aged 78) in Gallup, McKinley County, New Mexico; buried at Mission Garden of Memories Cemetery in Clovis, Curry County, New Mexico. 2. Robert Doyle James: born December 30, 1921 in Turkey, Hall County, Texas; married 1939 to Lela Marjory Holland (1921–2008), daughter of Jesse Martin Holland and Anna Josephine Cooper; died August 15, 2009 (aged 87) in Las Vegas, Clark County, Nevada; cremated, ashes scattered. 3. Truett Clarence “TC” James: born November 8, 1925 in Grandfield, Tillman County, Oklahoma; married Juanita Fay Nall; died December 18, 2011 (aged 86) in Farmington, San Juan County, New Mexico; known children include: John James and Tony Lynn James. 4. Betty Jo James: born September 4, 1927; married Frank Benjamin Rohrscheib, Jr. (1915–2003), son of Frank Benjamin Rohrscheib, Sr. and Emma Malissa Von Kanel; died February 23, 2017 (aged 89) in West Helena, Arkansas; buried at Sunset Memorial Park in Walnut Corner, Phillips County, Arkansas. Family Records of Toni Lynn James of Phillips, Arkansas, daughter of Truett Clarence James (1925–2011). 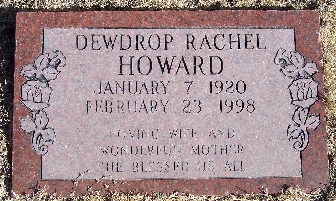 Find A Grave Memorial for Dewdrop Rachel James Howard (1920-1998), Memorial ID No. 12260767, created by Spyrose, added November 5, 2005. Find A Grave Memorial for Robert Doyle James (1921-2009), Memorial ID No. 160927584 , created by Ruth Sears, added April 11, 2016. Find A Grave Memorial for Truett Clarence “T C” James (1925-2011), Memorial ID No. 185644508, created by Inherit the Wind, added December 2, 2017. Find A Grave Memorial for Betty Jo James Rohrscheib (1927-2017), Memorial ID No. 77502751, created by Volunteer #46577499, added October 2, 2011. 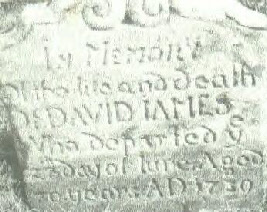 Below - Tombstone of Dewdrop Rachel James Howard (1920-1998). 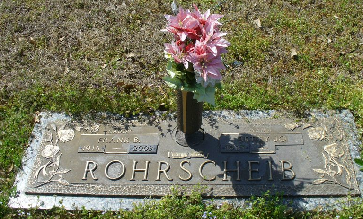 Below - Tombstone of Betty Jo James Rohrscheib (1927-2017) and Frank Benjamin Rohrscheib (1915–2003).